Third day of talks fail as no arrests are made and no pact looks likely for disputed mosque in Atali village. Tension continues to simmer between Muslims and Hindus at Ballabhgarh after meetings between the two communities on Sunday once again proved futile. Sources in the district administration admitted that they might have to change their dispute resolution strategy soon. The thorny issues in the ongoing tension are the Muslim demand for arrest of the accused and the construction of the disputed mosque in Atali village — the site of the original flare-up. “The first thing the Muslim community wants is the arrest of the Jat culprits. Only then will they return to the village. While the Jats will allow the Muslims to come back to the village, the construction of the mosque at the disputed site is not something most villagers are willing to concede,” a senior official, who didn’t wish to be named, said. Police said they were still trying to arrest the accused in the case. “We want the accused to be arrested promptly. There can be no talks until then,” Firoz Ali, a villager from Atali, said. “We are going to arrest them very soon. We have told the Muslim community about our efforts. The accused will not go unpunished. The situation is sensitive right now, so we need to proceed carefully,” Subhash Yadav, Commissioner of Police, Faridabad, said. Sunday was the third successive day when meetings to persuade the Muslim community to return to Atali village failed. The families had fled the village following communal violence on Monday evening. They are presently camped at the Ballabhgarh (City) police station. Like Saturday, a delegation of Jats, along with members of the district administration, met the Muslims and promised them that there will be no further violence. But talks failed once again as the construction of the mosque still continues to drive a wedge between the two communities. While Muslims maintain that the mosque is being built on Waqf land, Jats say the land belongs to the gram panchayat. The issue became the flashpoint for the rioting that saw hundreds of heavily armed men torch Muslims homes in an hour-long rampage. 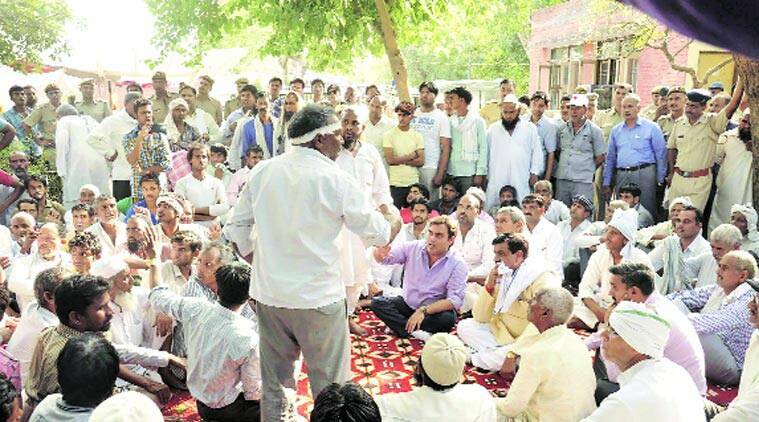 While the Jat delegation maintained that the construction of the mosque is not the issue, many in the village disagreed. “I don’t know what those who went to meet the Muslims said. But we are not going to allow the mosque to be built near the temple. First they wanted land for a graveyard. Now they want to build a mosque and tomorrow they will take over the village,” Satish Singh, a farmer in the village, said.